Exmouth is a town on the tip of the North West Cape in Western Australia. Get a sense of the local culture at Vlamingh Head Lighthouse and The Ningaloo Gallery. The adventure continues: have unforgettable encounters with a shark diving experience, see some colorful creatures with Turquoise Bay, tour the pleasant surroundings at Wobiri Beach, and explore the gorgeous colors at Ningaloo Reef. For ratings, photos, and more tourist information, refer to the Exmouth day trip planner. Thiruvananthapuram (Trivandrum), India to Exmouth is an approximately 23.5-hour flight. Traveling from Thiruvananthapuram (Trivandrum) to Exmouth, you'll lose 2 hours due to the time zone difference. Traveling from Thiruvananthapuram (Trivandrum) in April, you can expect nighttime temperatures to be slightly colder in Exmouth, with lows of 23°C. Finish your sightseeing early on the 21st (Sun) to allow enough time to travel to Broome. A relaxed town of tree-shaded streets and scenic coastal stretches, Broome gained renown as a center of the pearling industry in the late 19th century. 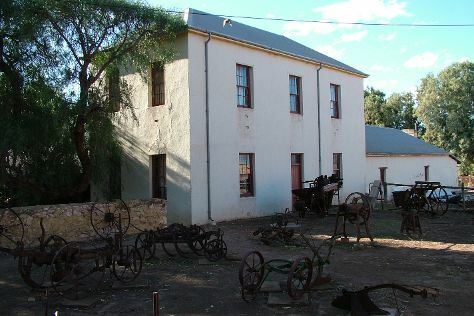 Broome Historical Museum and SSJG Heritage Centre are good opportunities to explore the local culture. Spend the 23rd (Tue) wandering through the wild on a nature and wildlife tour. And it doesn't end there: enjoy the sand and surf at Cable Beach, get up close to creatures of the deep with a dolphin and whale watching tour, view the masterpieces at The Courthouse Collection, and admire all the interesting features of Gantheaume Point. 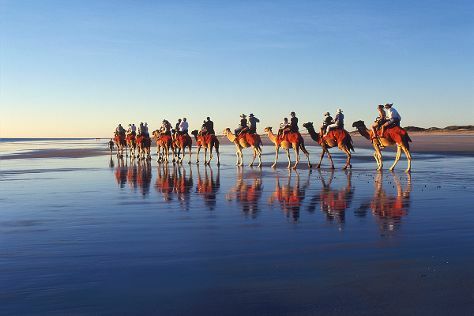 To see photos, more things to do, reviews, and other tourist information, refer to the Broome trip tool . You can do a combination of car and flight from Exmouth to Broome in 12 hours. Alternatively, you can fly; or drive. In April in Broome, expect temperatures between 40°C during the day and 26°C at night. Wrap up your sightseeing on the 24th (Wed) early enough to travel to Geraldton. Geraldton is a coastal city in the Mid West region of Western Australia, located 424km north of Perth.At June 2015 Geraldton had an estimated urban population of 39,825. HMAS Sydney II Memorial and Museum of Geraldton are good opportunities to explore the local culture. Step out of Geraldton with an excursion to Oakabella Homestead, Tea Rooms and Campground in Northampton--about 30 minutes away. 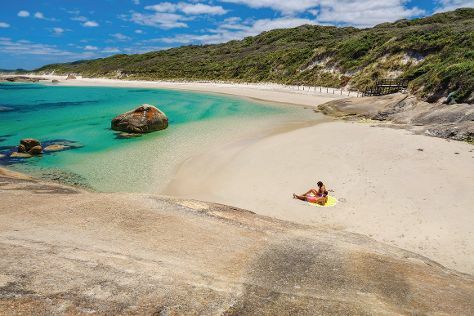 Next up on the itinerary: see the interesting displays at The Tin Heads, admire the natural beauty at Greenough Museum & Gardens, kick back and relax at Back Beach, and take in the architecture and atmosphere at St Francis Xavier Cathedral. Take the guesswork out of planning a Geraldton vacation by using our trip itinerary maker. Fly from Broome to Geraldton in 5 hours. Alternatively, you can drive; or take a bus. Traveling from Broome in April, expect Geraldton to be little chillier, temps between 33°C and 18°C. Finish your sightseeing early on the 27th (Sat) so you can travel to Albany. Founded as a military outpost in 1826, Albany is the oldest town in Western Australia, just barely gaining this title by being settled two years earlier than Fremantle and Perth. Get some cultural insight at National Anzac Centre and Albany's Historic Whaling Station. Get out of town with these interesting Albany side-trips: Denmark (Dark Side Chocolates, Elephant Rocks, & more). There's much more to do: take in the dramatic natural features at The Gap and Natural Bridge, admire the landmark architecture of The Church of Saint John the Evangelist, don't miss a visit to Albany Wind Farm, and appreciate the history behind Desert Mounted Corps Memorial. For where to stay, other places to visit, ratings, and tourist information, go to the Albany road trip website . Traveling by flight from Geraldton to Albany takes 4 hours. Alternatively, you can do a combination of flight and bus; or drive. Plan for slightly colder temperatures traveling from Geraldton in April, with highs in Albany at 25°C and lows at 13°C. Finish your sightseeing early on the 30th (Tue) to allow enough time to drive to Margaret River. A low-rise, laid-back town of approximately 4,500 inhabitants, Margaret River serves as an ideal local base to explore the surrounding wine region. Cape Leeuwin Lighthouse and Tassell Park Wines are good opportunities to explore the local culture. Explore Margaret River's surroundings by going to Meelup Beach (in Dunsborough), Busselton Jetty (in Busselton) and Jewel Cave (in Augusta). Spend the 1st (Wed) on a tasty journey with a beer tour and tasting. The adventure continues: savor the flavors at Food & Drink, explore the fascinating underground world of Lake Cave, do a tasting at Brookwood Estate, and look for gifts at Christmas in Karridale. Plan my trip to Margaret River with suggested itineraries provided by Inspirock. You can drive from Albany to Margaret River in 4.5 hours. Other options are to take a bus; or do a combination of flight and bus. Finish your sightseeing early on the 4th (Sat) to allow enough time to drive to Perth. 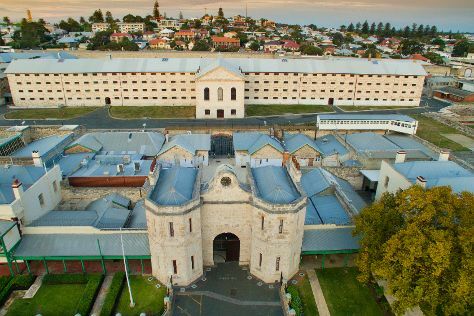 Your cultural itinerary includes sights like Fremantle Prison and The Nostalgia Box Museum. You'll find plenty of places to visit near Perth: Fremantle (Western Australian Maritime Museum & Fremantle Markets). Dedicate the 7th (Tue) to wine at some of the top wineries in the area. Next up on the itinerary: walk around Kings Park & Botanic Garden, appreciate the history behind Kings Park War Memorial, pause for some serene contemplation at St Johns Lutheran Church, and snap pictures at Elizabeth Quay. For more things to do, where to stay, and more tourist information, you can read our Perth trip maker app . Getting from Margaret River to Perth by car takes about 3 hours. Other options: take a bus; or do a combination of bus and train. In May, daily temperatures in Perth can reach 25°C, while at night they dip to 11°C. On the 8th (Wed), wrap the sightseeing up by early afternoon so you can travel back home.